Since 2014, the YPPT has run 29 projects involving around 900 children and young people aged 10-18. Our projects have both practical and social benefits for the young people involved, and also wider benefits for the local community. You can read more about our recent impact in our 2017-18 impact report (available to download here) or on our Testimonials page. Our projects offer access to a huge range of art forms, many of which would not usually be accessible to primary school children. These include visual arts such as painting, drawing, sculpture, textiles, woodwork and more, and also theatre-specific arts including puppetry, voice acting, narration, lighting design, costume design, stage management and sound effects. 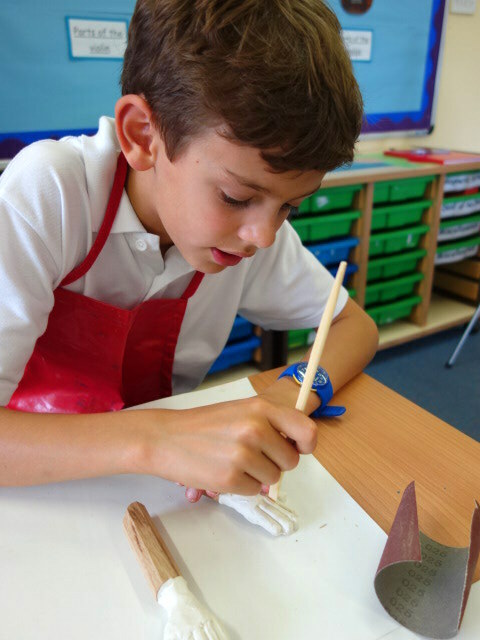 A project will cover almost all of the Art and Design & Technology requirements for Year 6, as well as making a contribution to literacy (click here for more information). As an extra-curricular activity in secondary schools, the project enhances the curriculum, reinforcing learned skills and teaching complementary ones. Each child involved in a project designs and makes their own marionette, which is theirs to keep after the performances. The projects are artistically challenging, and we support the children to improve their existing artistic skills as well as discovering and developing new skills and talents. They also improve their motor skills through creating the fine detail on the puppets and set and learning to manipulate them. The final performances are lush in detail and offer opportunities for spectacular sets, intricate costumes and amazing special effects that are not normally possible in primary schools. YPPT projects provide a new environment for children and young people in which they can learn new things and feel supported to achieve. They can be particularly beneficial to children with English as an additional language or with other language and communication difficulties who may struggle in the academic curriculum, but discover new skills through our projects. One child who has benefitted in this way in the past is Hilmi - you can find out more about him in the video to the left. FOCUS/ENGAGEMENT - the projects' length (usually 6 months - 1 year) means that the young people learn to work through a process from start to finish. It allows them to develop a focus and concentration over many weeks, and to learn to plan ahead. It also means that they have time to engage with the project more and become more invested in it, making their sense of achievement and pride at the end even greater. CONFIDENCE - as the young people acquire skills and knowledge, they also acquire increased confidence in their own abilities. This is especially true during the performances, when it becomes clear to them that they have exceeded the expectations of their parents and teachers as well as their own. They have a huge sense of pride in themselves at having designed, made and performed all aspects of the show themselves. This is especially true for children with learning and communication difficulties or other disadvantages, who feel extraordinarily proud of themselves for having achieved on an equal or even greater level than their classmates. TEAMWORK - by working together on the set designs and the show, the young people learn not only how to work with others, but also that they can make an individual valuable contribution to a group project. The level of teamwork required to produce a show is far higher than usually seen in primary schools, and has been described as 'astonishing' by more than one headteacher. This is also especially valuable for disadvantaged children, who may feel that they are usually unable to contribute to team activities in any meaningful way. MOTIVATION - the unusualness of the projects grabs the young people's attention almost immediately, and they become incredibly engaged with the process within the first few sessions. Children who are usually difficult to motivate flourish on our projects as they discover new things, and end up learning without even noticing it. This motivation often spills over into other aspects of their lives. INDEPENDENCE - we support children to develop the skills to make their own decisions. For example, the children are given creative freedom while designing and making their puppets, although a project leader is always there to teach skills and to support them. Although initial rehearsals are largely adult-led, the project leader's role gradually shrinks as the children gain the skills needed to work as a team, so that they are able to perform without adult input (although an adult remains backstage for safety reasons). RESILIENCE - our projects are challenging, and by supporting the children to work through the challenges, we enable them to develop their tenacity and resilience in the face of difficulty. LEVELLING - because the activities are new to all of the children, and because most of the roles in the final performances happen behind the curtain, the projects are a great leveller, with each child having equal opportunities regardless of other difficulties in their lives. Children who struggle with academic subjects may find themselves the best in the class at sewing, or at puppetry, and flourish in this new learning environment. Similarly, children with learning, communication or emotional difficulties will be able to play a valuable role in the final performances in a way that would be impossible in a traditional school play. In the performances, the audience cannot tell which child played which role backstage; the overall effect is one of an ensemble, with all the children being equal participants. COMMUNITY - although each project only involves up to 40 children, it also has an impact on the wider community. We know from experience that the children talk about our projects at home, leading to parents becoming curious and more engaged with the school. Multiple schools have reported improved relationships with parents as a result of our projects - the video on the right, from Shirley Primary in Cambridge, is an excellent example. In addition, younger children in the school and local community benefit not only from the improved social skills of the young people involved, but also from short puppetry workshops that the older children are encouraged to lead as part of our project. We also engage with other community groups, including inviting care home and elderly local residents to our performances.